After the decision of 3D video production, I had to figure out the recording technology. I have read many articles about theory and best practices about shooting real 3D films. Based on my research I decided to use two separate cameras, especially for one major reason. I wanted to have a variabe distance between both lenses. Why? Because of the final 3D-effect on displaying devices and eye comfort during watching the result video. If you shoot in interiors, like rooms and corridors (or a forest - trees there are also quite close to each other) on relatively short distance, the lenses distance should be short. It doesn't mind if they are even closer to each other than human eyes. The 3D-effect is strong enough in this configuration and if you place the lenses too far from each other during recording in interiors, final result would look weird and uncomfortable to watch. On the contrary, if you shoot outside of buildings, but still in a city for example (where the objects are 10 meters and more far away from the camera), the lenses distance should be further, somehow around real human eyes distance, or little bit more. And if you shoot long-distance scenes like landscape, camera lenses should be definitely further from each other than human eyes are. Otherwise the final 3D-effect is not enough visible and the footage looks flat. So, the main requirement on the 3D camera was clear. Besides that it definitely had to be something portable (light and small), with high image quality, and of course cheap. Choosing some small action camera seemed to be the right way. But twice of course. This fact made the whole thing quite budget demanding, considering buying two pieces of GoPro (any type, they are all overpriced in my opinion). Fortunately in that time when I was planning my real 3D camera, Xiaomi released their first generation of small action camera Yi. The price was a nice surprise - less than half comparing to GoPro with the same parameters. Great. So the solution about the right cameras was set. It was obvious that 3D camera itself would have to be mounted on a stabiliser, or the result would be again unusable. Since I had already spent a lot (of my student's "income"), I have decided to buy a cheap mechanical counter-weigth based stabiliser. Well, what should I say...this was a wrong choice. I said to myself that this will be some kind of beta-testing phase and if it goes well, the 3D video would look ok, then I will buy some proper electronic stabiliser. So I started to work on the first version of my 3D camera in autumn 2016. The main idea was nothing complicated - just to attach two action cameras next to each other and to be careful with horizontal position of them - always perfectly parallel. As I pointed out above, my demand was to have the cameras variable in distance from each other. 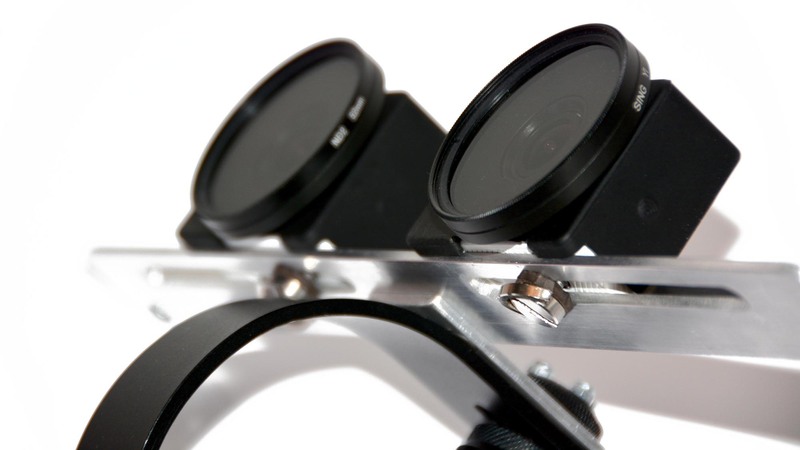 Since Xiaomi Yi has classic photo 1/4" screw hole, I could use it to attach the camera easily to the rig. The rig itself is just 30 cm long aluminium flat profile 3x30 mm with two long rail holes for the 1/4" screw for each camera. I haven't use any CNC or something like that, it is real hand-crafted job with vice, electric drill, and file. Tough job I can tell. The flat profile is strengthened by another aluminium "L" profile, as you can see on the pictures below. And in the middle it is attached to the stabiliser. Nothing more, really simple solution. I think there is no need to explain anything more, just check the photos and you will see everything clearly. Cameras can be moved left or right by releasing the screw in order to change the distance between them. Actually the counter-weight pictured on the photo is not in it's original position - it was mounted at 50 cm long aluminium extension in order to have the center of gravity as low as possible. I have already used this extension for some another project, so that's why it is not on the photo. Chernobyl 3D 2016 documentary was made using cameras configuration described above.